The basic theme of Ticket to Ride is that five old friends have made a million-dollar bet to see who can travel by rail to the most cities within seven days in turn of the century America (or other destinations, if you buy the various expansions/map packs). Note that nowhere in that description is there any mention of aliens, dinosaurs, or science fiction of any kind. But that’s exactly what Alvin and Dexter introduces to Ticket to Ride. Aliens and dinosaurs are taking over the cities you’re trying to reach and, in the process, seriously complicating your efforts to build your rail network. It’s a very weird thematic addition and the question is: Do monsters make everything better, or do they just cause a train wreck? 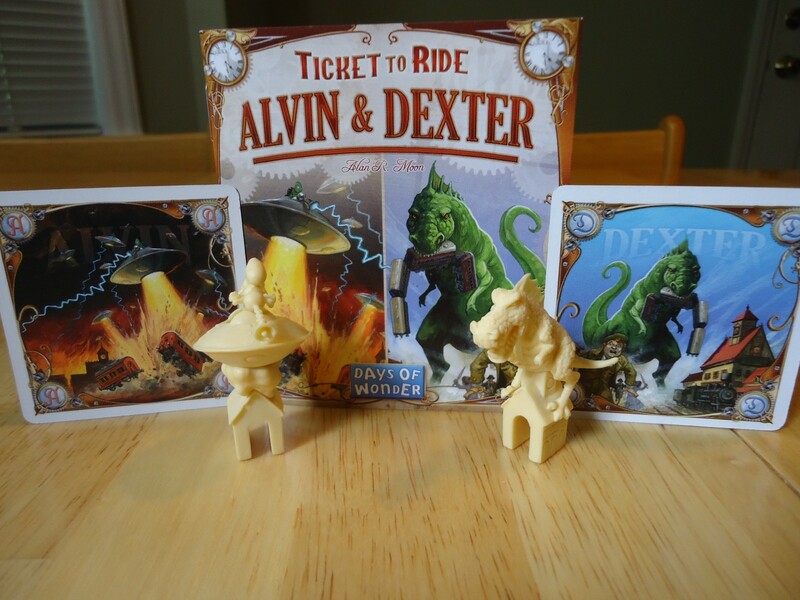 Alvin the Alien and Dexter the Dinosaur have arrived and are causing chaos on your Ticket to Ride maps. When they appear in cities, players can no longer build in or out of those cities. It’s to your advantage to control their whereabouts, not only to block other players from getting the routes that they need, but so that you can rack up the bonus points that come from being the best monster wrangler. All of the normal rules of Ticket to Ride remain the same, and this expansion works with all versions and maps of Ticket to Ride. Once the regular game set up is complete, the player who will go last places Alvin on any city on the map. The player to his or her right the places Dexter on any other city of their choice. The two decks of monster cards are placed next to the board and the monster bonus cards are placed with the bonus cards from the base game. Any city or country (in games with country tickets) with a monster on it is considered to be “In Chaos.” Players may not claim routes into or out of a city or country that’s in chaos. Only once the monster leaves the city can routes be claimed again. On your turn you may, in addition to your normal action, play one or two locomotive cards to acquire a monster card and move a monster on the map. Only one player per round can control each monster, and no player can control both monsters at the same time. Alvin and Dexter in action on the board. When you take a monster card, place it face up on the table in front of you, take the corresponding monster, and move it to a new destination. If you played one locomotive card, you may move the monster up to three cities away. If you played two locomotive cards, you may move the monster up to six cities away. The monster card remains face up in front of you until your turn comes around again. During that time, no other player may move or control that monster. Once your turn comes around again, turn the monster card face down and place it on top of any other monster cards you have acquired. Another player may now take control of that monster if they wish. If the monster deck(s) run out of cards, no player may take control of the monster(s). The player with the most Alvin and/or Dexter cards wins the Alvin and/or Dexter bonus card(s) and the associated points. If players are tied with the most monster cards, they all score the bonus. The winner of the game is still the player with the most total points. Wacky Fun or Complete Train Wreck? Let’s get this out of the way up front: If you are a Ticket to Ride purist and cannot imagine anything messing with the calm, turn of the century vibe, then you are not going to like Alvin and Dexter. These two monsters make absolutely no thematic sense whatsoever. They exist simply to cause chaos and give you additional ammunition to use against your opponents. Would it have made more thematic sense if they were striking workers, damaged tracks, or train wrecks? Absolutely. But they’re just silly monsters. If that’s going to bug you, you will probably dislike this expansion. 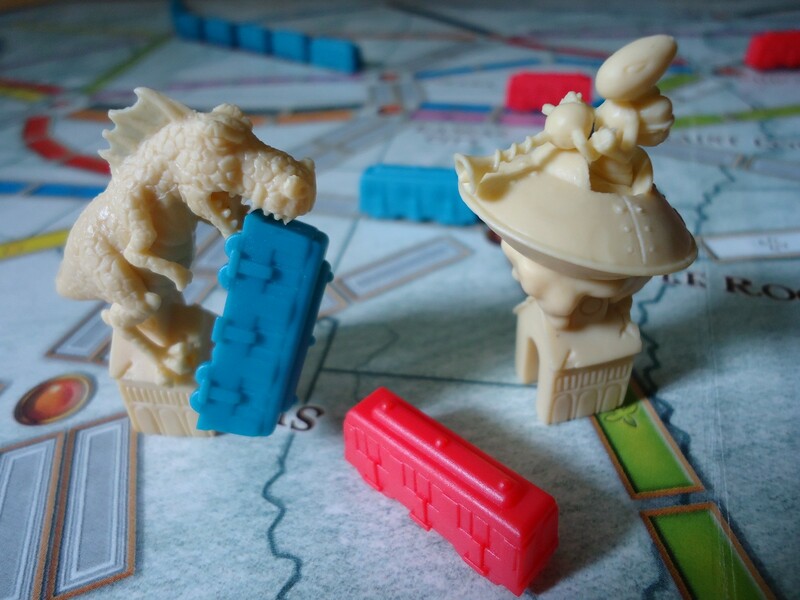 However, if you are open to a little weirdness and can enjoy these critters for the chaos they cause, the extra strategy they encourage, and the silliness they bring to an otherwise quiet game, then I think that they improve the base game of Ticket to Ride greatly. You now have to make an additional decision about what to do with your locomotive cards. Do you use them to claim a route or move a monster? Which is going to benefit you the most? Locomotive cards aren’t easy to come by, so having an extra way to use them adds some tough decisions. You have to remember that routes cannot be completed to cities/countries with monsters in them. If you’re working on a great ticket but a monster appears in a city along the way, you may have to either abandon your plans or make plans to get that monster out of your way (and hope he doesn’t come back before you can complete the route, or that someone else doesn’t snag your route before you can). You can also keep an eye on what your opponents are doing and try to maneuver the monsters into their paths to keep them from scoring big or getting part of a route that you need. You must consider the bonus for moving the monsters the most. Even if you don’t see a clear motive for moving them, you may need to start monster wrangling in order to get the bonus or keep someone else from getting it. This is made more complicated by the fact that earned monster cards go into a stack next to each player’s area, so you can’t readily see exactly how many other players have and who is going to win the bonus. You can hazard a guess if you have a good memory, but you aren’t going to know for sure (unless someone has a huge stack, in which case you’re probably hosed anyway). You must remember that any tickets that have a monster in their cities at the end of the game are worth half of their normal value. So a 12 point ticket will be worth only six points if you complete it. But that applies both ways: If you don’t complete the ticket, you only lose six points. So a last minute monster move can either cost you points, or keep you from taking a beating on a high value ticket that you cannot complete. Ticket to Ride is often criticized for being nothing more than multiplayer solitaire and too easy. The only chance you have to mess with your opponents is by blocking the routes that they’re trying to complete. It’s non-confrontational. There’s certainly nothing wrong with that and, in fact, many people choose Ticket to Ride for that very reason. They don’t like meanness and take-that style gameplay. Furthermore, the basic game of Ticket to Ride offers limited strategy choices. You’re basically trying to assess your odds of completing high-value tickets against those of completing several smaller tickets. You have to watch what your opponents are doing and try to beat them to the routes you need. This is what makes it a great game for beginners. There’s not a whole lot to think about, so they can get their head around the rules and play-style of a “euro” game. Alvin and Dexter changes all of that and turns Ticket to Ride into, if not a totally new game, at least one that’s got a lot more meat on the bone. 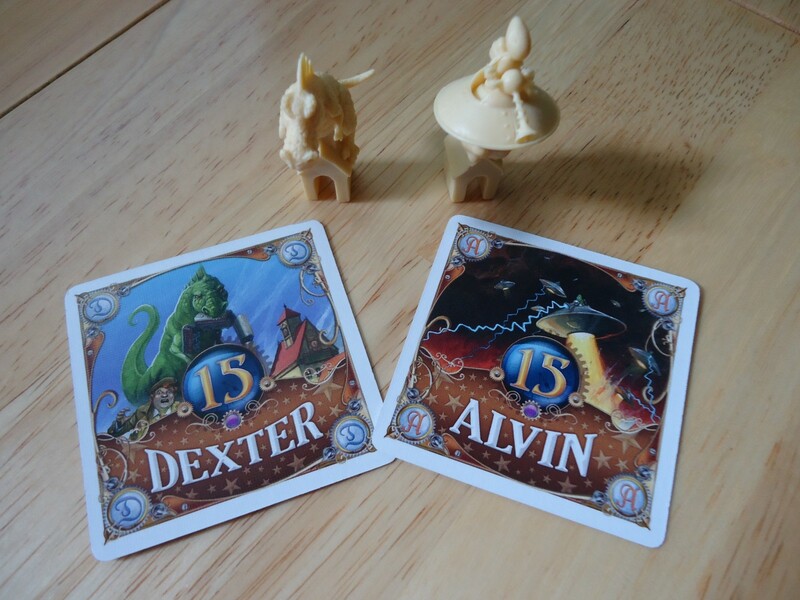 If you find basic Ticket to Ride boring and you ache for some chaos, interactivity, and ways to mess with your opponents, then you will appreciate Alvin and Dexter. They turn Ticket to Ride into a more aggressive, take-that style game that encourages you to mess with other player’s plans. Now you can block routes with trains and/or monsters (although the monsters may only provide a temporary block). It gets even meaner/more aggressive on the smaller maps like Nordic Countries, Switzerland, and India. Put Alvin and Dexter on those maps and the game can go from challenging to downright brutal. Alvin and Dexter also provides extra layers of strategy. Ticket to Ride still isn’t a super brain burner, but having to consider whether to use a locomotive card to move a monster or complete a route is now a major consideration. Further, if you’re going to move a monster, do you move one to block an opponent, or do you move one to free up a route for yourself? Which is more important? And don’t forget the bonuses. They are hefty and go to the players who move the monsters the most, so you may want to move a monster instead of completing a route if you think you have a good shot at the bonus. Finally, you want to keep track of where the monsters are near the end of the game. If you can position a monster in such a way that an opponent fails to get full value from a high value ticket, you may be able to eke out a win. Similarly, if you can position a monster in such a way that you don’t take a beating because you couldn’t complete a high value ticket, you may win the game. Yes, you want to complete as many routes as you can, but where those monsters end up at the end of the game can make a huge difference in your score. 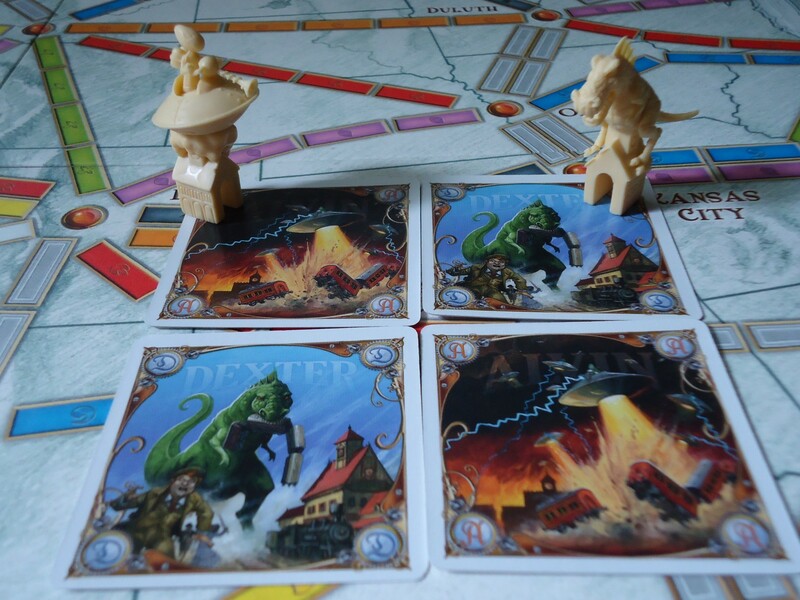 The monsters add a lot more to think about when compared to basic Ticket to Ride. Alvin and Dexter on a rampage. The one thing about Alvin and Dexter that may mar the game for some is that pretty much everyone in the group has to be committed to using the monsters. This isn’t like some games where players can ignore expansion components and still have an equal chance of winning. It’s certainly possible to ignore the monsters altogether, but players who do so will be at a definite disadvantage. More than once I’ve seen someone get upset because they either didn’t want to play with the monsters because they didn’t like the meanness, or they didn’t fully understand how they work. If you’re going to add this to the base game, it should be with a group of experienced Ticket to Ride players who are all willing to use the monsters to the max and who are okay with going after each other. Otherwise, you’re risking hurt feelings. What’s stellar about this expansion (aside from the models) is that for very few rules and components, you get a lot more gameplay. The game comes in a small box and all of the components will easily fit in any Ticket to Ride Box, saving you shelf space. It may seem pricey for how few physical components are in the box, but the value is in what it adds to the game. 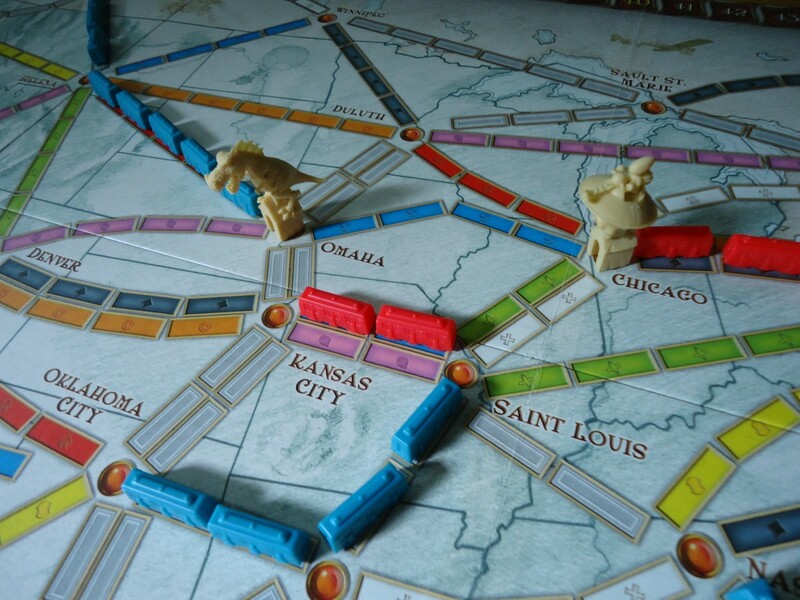 With so few rules and changes, even moderately experienced Ticket to Ride players will be able to add it to their games with no lengthy explanation necessary. We no longer play basic Ticket to Ride in this house unless we’re playing with inexperienced players or non-gamers. Alvin and Dexter are always on the table. The base game was great when we were just starting out, but over time it fell out of favor because it just didn’t offer enough oomph compared to other games. Alvin and Dexter rescued Ticket to Ride for us. We love the extra strategy and interactivity. It makes the big USA map much more entertaining for two players and the smaller maps become even more challenging. If you feel that Ticket to Ride has had its day, this is an inexpensive way to breathe new life into the game. The theme is admittedly weird, but anyone who has a sense of humor should be able to chuckle over the notion of aliens and dinosaurs in Ticket to Ride and appreciate what they add to the game. Can be played with any version of Ticket to Ride. Adds conflict and interactivity to an otherwise solitary game. Models are excellent quality and ripe for painting. Everything fits in the original box, saving shelf space. For such a small expansion with few additional rules, it adds a lot of strategy to the gameplay. The theme is either love it or hate it. Introduces some screwage and take that into the otherwise calm game play of TTR. Everyone must want to play with the expansion for the best experience.